Distance never truly separates good friends, but it can certainly make planning a wedding challenging! If you have out-of-town bridesmaids in your wedding party, it’s a struggle to find ways to include them in all the festivities. It’s especially difficult because your out-of-town bridesmaids are probably the ones who need to be included the most. After all, if they’re not local, they may not know your friend group well. And you don’t want them meeting all the other bridesmaids for the first time on your wedding day. You may not expect them to attend the bachelorette party or bridal shower—but how do you make out-of-town bridesmaids feel like part of the group? The good news is: You don’t have to do too much differently! No matter how near or how far your out-of-town bridesmaids live, send them all the same invitations everyone else in the bridal party is getting. And send the invitations using the same method. If you’re sending a Facebook event invite to your bridal party, include the out-of-towners even if you know they can’t come. Or if you snail mail your bachelorette invitations—send one to your far away friend, too! By including them just like you’re including everyone else, they not only feel like part of the group—they also know what’s going on and can help contribute and participate if they’re able. It doesn’t matter if you’re wedding dress shopping or bridesmaid dress shopping—include your out-of-town friends. Harness the power of technology and social media so they can get real-time updates. Video call them while you’re hunting in the racks, or send them photos of your favorite dresses. This ends up being a win for everyone, too, because now you have documented moments of you and all your friends trying on dresses and having fun. If you plan to go dress shopping with just family or a few friends, however, don’t feel pressured to include your out-of-town bridesmaids. Unless, of course, you want them there! When you asked your local friends, you probably did so over coffee or evening drinks. It was personal, and maybe you gave them a gift, too. Replicate that as best you can with your long-distance gal pals. Schedule a video call with them, or mail them a surprise package that asks the question. That’s exactly what April’s BBF did. 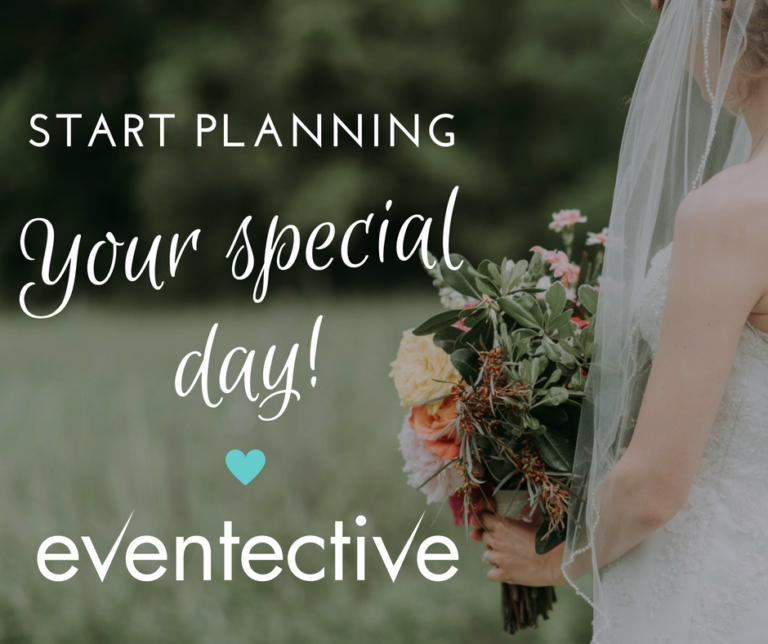 April is one of Eventective’s Content & Support Advisers, and a few years ago, she was the maid of honor in her childhood best friend’s wedding. So what was the catch? Well, April was living in Florida at the time, while helping plan a wedding in California. But April’s BFF didn’t let distance stop her! April, of course, said yes! And most importantly, she was touched by the time her friend took to ask her “in person” when they were so far apart. Give your out-of-town bridesmaids something to do. This is the easiest way for them to feel involved—plus, it takes something off your to-do list! It may be tricky for them to coordinate a bridal shower, but put them to work on the weekend of your wedding. If you have centerpieces that need to be created, last-minute errands to run, or any special requests on your wedding weekend—ask your traveling friend. Your out-of-town bridesmaids may have local friends or family they plan to stay with—that’s great! Just make sure to confirm their plans. They may be strangers to your area, and not know anyone or where to stay. If that’s the case, definitely arrange somewhere they can stay. It can be something as simple as staying with your parents the night after the wedding—that’s where April stayed after the wedding! Be sure to ask how long they’ll be in town, too. You may be jetting off on a honeymoon, but if they’re sticking around, recommend some places to eat at, and things to do before they go. It’ll give them an inside look at where you live. Plus, it will make them feel a little closer to you. Don’t forget to include your out-of-town bridesmaids! They want to be just as involved as the rest of your bridal party. By making just a few minor adjustments—and taking lots of pictures!—you can make them feel like part of the group. This makes them happier, and makes their attendance at the wedding seamless and not awkward. Do you agree? Maybe you and April had similar experiences. Or maybe you didn’t—and you wish you had! Share your experiences below, we want to hear all about them!